Rivky Berman, a young Chabad-Lubavitch emissary who inspired many throughout her lifelong struggle with illness, passed away May 29 at the Duke University Hospital in Durham, N.C. She was 29 years old. Born in Stamford, Conn., to Rabbi Yisrael and Vivi Deren, Rivky Deren grew up in an atmosphere where serving G‑d with joy and sharing Judaism with others was paramount—even when things were not easy. She was one of several siblings who were born with Bloom syndrome. In addition to affecting her growth, the condition caused Rivky to be prone to many illnesses. Nevertheless, throughout her life Berman maintained a spunky, upbeat attitude, and had a unique ability to share the hope and joy that defined her life with others. She shared that positive attitude in blog posts, personal counseling and in every venue available to her. Lustig adds that “even though she had so many strikes against her, no one thought of her as anything other than normal since she saw herself as just a regular person. In camp, we would sing and dance at every meal, and all the staff would make sure to dance with the campers to try to cheer them up. Even though she herself was a camper, Rivky was up there dancing with others, never thinking of herself as in need of encouragement. 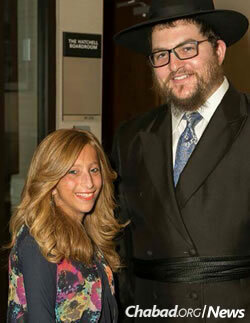 After a successful lung transplant, she married Rabbi Shmulie Berman in the summer of 2012. The young couple looked forward to establishing themselves as Chabad-Lubavitch emissaries, something her family had devoted themselves to since great-grandparents Rabbi Sholom and Chaya Posner moved to Pittsburgh in the mid 1940s to head the Chabad educational system in that city. The Bermans moved to North Carolina, where Rivky had once been hospitalized waiting for her lung transplant. There, they helped with undergraduate programming at Chabad of Duke and were instrumental in the founding of Chabad at North Carolina State University. In 2015, she was found to have lymphoma and was once again admitted to the hospital. Even from her hospital room, she continued to reach out, organize and serve—orchestrating an entire Purim celebration from the confines of her bed. Yet, despite her frequent challenges, she said that “my family and I have gone through many difficult times. The teaching of tracht gut vet, zein gut [‘think good, and it will be good’] almost became a refrain in our lives. In typical fashion, she and her family converted her hospital room into an ad hoc Chabad House, where parties were hosted and people were invited to do mitzvahs. 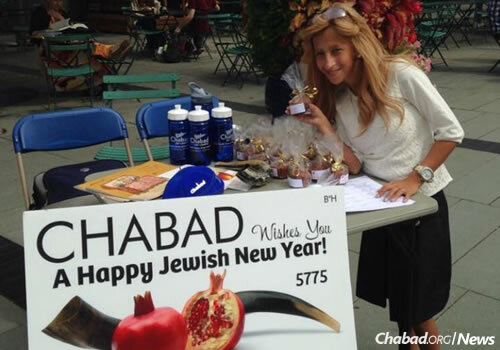 Despite her illness, she remained active, recently joining the Ruderman Chabad Inclusion Initiative advisory committee with the hope of advancing inclusion for people with disabilities, and emphasizing the equality and value of everyone in the community. In addition to her parents and husband, Rivky Berman is survived by her siblings Rabbi Yossi Deren, Rabbi Asher Deren, Rabbi Chezky Deren and Chanie Backman. She was predeceased by her siblings Shlomo Aharon Deren, Blumi Deren and Rabbi Mendel Deren. The funeral will leave Shomrei Hadas Chapel at 3803 14th Ave. in Boro Park, Brooklyn, on Tuesday, May 31, at 11:15 a.m., passing by Lubavitch World Headquarters at 770 Eastern Parkway in the Crown Heights neighborhood of Brooklyn at 12:15 p.m.
Internment will follow near the Rebbe’s resting place‎ at the Old Montefiore Cemetery in Queens, N.Y.
Shiva will begin 7 p.m. on Tuesday at 121 Little Hill Drive in Stamford. Hashem gives but one life and Rivky lived it to the fullest. May her memory be for a blessing for her family.